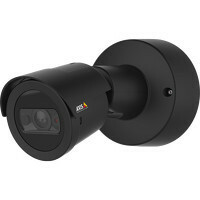 Compact, bullet-style HDTV network camera comprising a main unit and a separate IP66-rated camera unit. Edge storage using microSD card or NAS, Support for ACAP and AXIS Camera Companion, I/O port, multiple video streams in H.264 and Motion JPEG. 25/30 fps in all resolutions up to 720p. PoE and 8–28 VDC support. Includes stand and clamp for camera unit and DIN rail mount for main unit. Midspan not included. 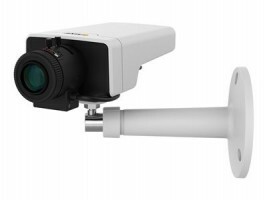 Stylish and functional design AXIS M2014-E is a high-performance, compact bullet-style network camera, designed for maximum flexibility and ease of installation. The camera´s functional and compact form factor makes it perfect for installations in retail stores, boutiques, hotels and small offices. Easy and flexible installation The camera has a unique design concept comprising a main unit and a separate camera unit, which allows these units to be mounted up to 8 meters (26ft.) apart, providing flexibility to place the camera unit in one place and the main unit elsewhere. Convenient video management solution AXIS M2014-E offers a small-scale, convenient video management solution with its built-in micro-SDHC memory card slot for edge storage and support for AXIS Camera Companion. 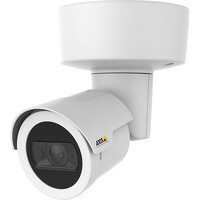 Intelligent video capabilities AXIS M2014-E supports intelligent video features such as motion detection, tampering alarm and I/O ports for connecting external devices. 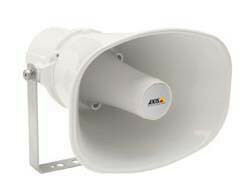 In addition, AXIS Camera Application Platform support is also provided.